KADY International offers both top entry and bottom entry laboratory mills. Our newly engineered top entry mill is fast and efficient, offering nearly unlimited mixing and dispersion combinations. Meanwhile, our bottom entry mills continue to provide speedy, consistent blends that benefit all kinds of applications. KADY will customize any of its designs to perfect your application. 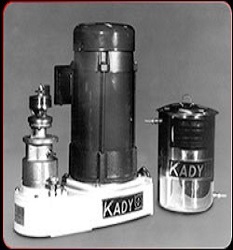 Reach out to KADY for laboratory mills that are superior every time. If you’re looking for “big picture” support when it comes to laboratory mills for your application, contact Frain Industries. Frain offers both machines and services. You may purchase any of our certified pre-owned mills as is, or you can turn to our engineering team, which provides project planning and management, sustainable solutions, testing and advanced integration services. Don’t miss out on Frain’s comprehensive service. Contact us today! The first Ross Three Roll Mill was built in 1869 and offered to paint & ink manufacturers. We revolutionized pigment dispersion — with superior consistency and finer dispersion than ever before. Today, the original Ross Three Roll Mills are still the standard by which all others are measured — in applications as diverse as magnetic coatings, cosmetics, paints, inks and high performance ceramics. Our design is unsurpassed for safety, product consistency, easy operation and long-term value. Without question, you should turn to Admix for your laboratory mill needs. Founded in 2000 and pulling from the knowledge of experts all across the pharmaceutical and biotech industries, Admix’s cost effective laboratory mills constructed from FDA approved materials and meet safety and hygiene standards for GMP facilities. Many are 3-A certified and cGMP compliant. Upon request, Admix will provide Factory Acceptance Testing (FAT), QA and full validation packages. Call Admix today! ARDE Barinco products have always been, and continue to be, on the cutting edge. A manufacturer of speciality mixing, grinding, dispersing, emulsifying and size reducing equipment, we have expertise to custom design laboratory mills to satisfy your specifications. A subsidiary of a manufacturer for the aerospace industry and beneficially aligned with many partners, ARDE has great stores of skill with which it produces creative, extensively tested machines. Turn to ARDE for our expert knowledge. Laboratory Mills have a vast number of uses in a wide range of applications and industries as mills themselves provide a specific advantage when it comes to breaking down materials into a powder. Perhaps the most common type of laboratory mill in use would be ball mills as they are heavily prevalent in the laboratory setting for a variety of advantages they provide. If you are unsure if your application requires a ball mills, we suggest that you contact an experienced laboratory mills manufacturing who will be able to evaluate your application and work environment in order to determine if a ball mill is right for you or if it isn’t they may be able to suggest a solution that provides more value to your overall process. These ball mills function by containing cylindrical shapes, or balls, or they can contain ceramic balls, stainless steel balls or even flint pieces. These grinding materials are utilized in breaking down a desired material into a crushed powder. Ball mills achieve this by rotating on a horizontal axis, which forces the grinding matter to rub up against another matter to create the final desired crushed powder which can be used for a large number of applications. Think of a rock tumbler, this uses similar technology to polish rocks and other artifacts. Grinding mills tend to be the go to choice for mechanical alloying as grinding hard materials inside of a ball mill is an easy task. As mentioned before the grinding materials can consist of a variety of substances but the most common choice is the stainless steel balls as it has the ability to crush just about any material. In a laboratory setting, a laboratory mill may need to utilize other substances as steel cannot come into contact with sensitive or flammable materials. Whatever your application may be, finding the right laboratory mill for your application depends heavily on which laboratory mill manufacturer you choose to work with. The more experience and knowledge that a manufacturer has the better your chance of receiving a product that goes above and beyond your expectations.